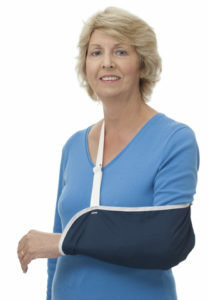 Shoulder surgery is regularly performed at New Victoria Hospital. This is usually performed as a day case operation, and does not require an overnight stay. Routinely you are seen after the operation once details of your surgery and rehabilitation have been confirmed by the surgeon. A physiotherapist may introduce themselves to you on the morning of your surgery, and answer any queries or worries you may have. Following surgery, you are likely to feel quite fatigued. A local anaesthetic or nerve block may have been used to help with post-operative pain, which can make your arm feel very numb. This can take 24 hours to resolve, and you may experience some tingling as this happens. A result of this numbness, your arm will be in a sling following surgery. The physiotherapist will also perform passive movements to your operated shoulder to check for signs of stiffness. Continued physiotherapy is required to ensure the best recovery following surgery. This should start 3-4 days following surgery, and will focus on regaining range of movement and power. Find more details on post-operative rehabilitation here. Stabilisation procedures often require immobilisation for 6 weeks, therefore physiotherapy would not start until 6 weeks post surgery.